Vignarola is as essential to the Roman diet in spring as the May Pole is… to well, whoever dances around a May Pole. My point is… Vignarola is spring… and it’s delicious! 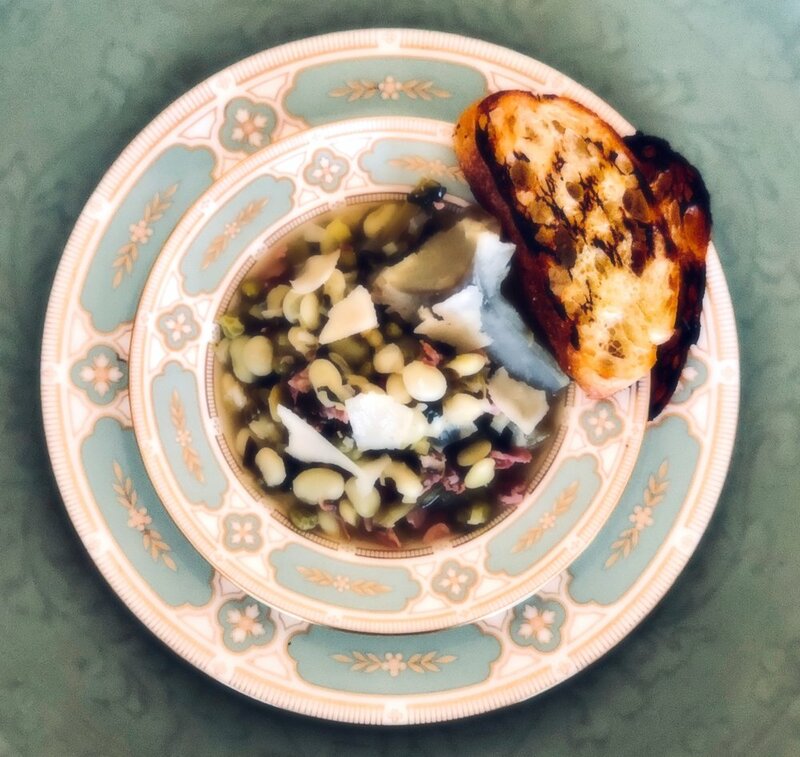 Now classically Vignarola is made in the first part of spring, during those weeks when spring peas, broad beans/fava beans, and artichoke are at their sweetest…so yeah, theres a time window there. Pairing those sweet tender treasures up with prosciutto or guanciale from the winter’s curing adds another layer of flavor to the dish. The addition of spinach or chard tend to be a newer idea, outback in the day shredding up lettuce such as romaine into the stew was much more common. Traditionally vignarola is thought more of as a stew. Considering the cooks were gathering up tender pods of fava beans and peas, one would have to slowly braise the legumes until tender, thus creating a hearty stew. For my recipe, the vignarola is more of a soup than a stew, for the simple reason of "convenience food items" like partially cooked or flash frozen fava beans and peas. All of my legumes did not need to “stew” as long, and well… I love a flavored broth to go along with the goodies found in the bowl. You do you though. If you’re wanting more of a soup.. add more broth. If you like the idea of a traditional vignarola then back off on the stock and cook your vegetables slow and low. So let’s talk about the artichokes. My grocer happened to have a fresh haul of artichokes from California in and they looked too good to pass up… thus today's vignarola. So I prepared, trimmed, cut, and par-boiled my artichokes instead of simply buying the hearts canned. Yes, I realize whole fresh artichokes are one of those “scary” vegetables people stay away from. People choke when it comes to artichokes either because they have no idea how to prepare them, or they take too much time and buying canned is a lot easier. Look, I get it. My choice when it comes to vignarola is to start at with the whole artichoke and work it down to the wonderful, edible, heart. Canned tastes… like they were canned and are filled with preservatives. It’s a spring soup so I think everything should be fresh and ready (ignore the frozen fava beans and peas). But seriously, if you choose to use canned or frozen artichoke hearts or bottoms then good on you. I’m just glad you’re making vignarola because it is so dang good! If you are unsure how to prepare whole artichokes then I strongly encourage you to check out YouTube. There are many people with more steady hands and better equipment than my iPhone and free hand, explaining and showing viewers how to prepare an artichoke. I will definitely include one n this post so scroll down. Okay, let's get to the Vignarola! Fill a large soup hot with cold water and add salt. Start preparing your whole artichokes: Trim the stem’s end, and with a vegetable peeler strip off the outer layer of that stem. Remove the top 1/3 of the artichoke, then with sharp scissor knock off the prickly tops of the leaves. Cut the artichoke in half, with the stem intact, and rub the whole “choke” (all of the cut artichokes) with the two cut lemons. The juice from the lemons will help prevent browning (oxidation). Add the spent lemons to the pot. When the water starts to simmer and all of your artichokes are prepared and cut in half, place them carefully in the simmering water. Let them simmer along with the two cut lemons, for 20 minutes. Remove the halved chokes from the pot and let them cool just long enough to handle. 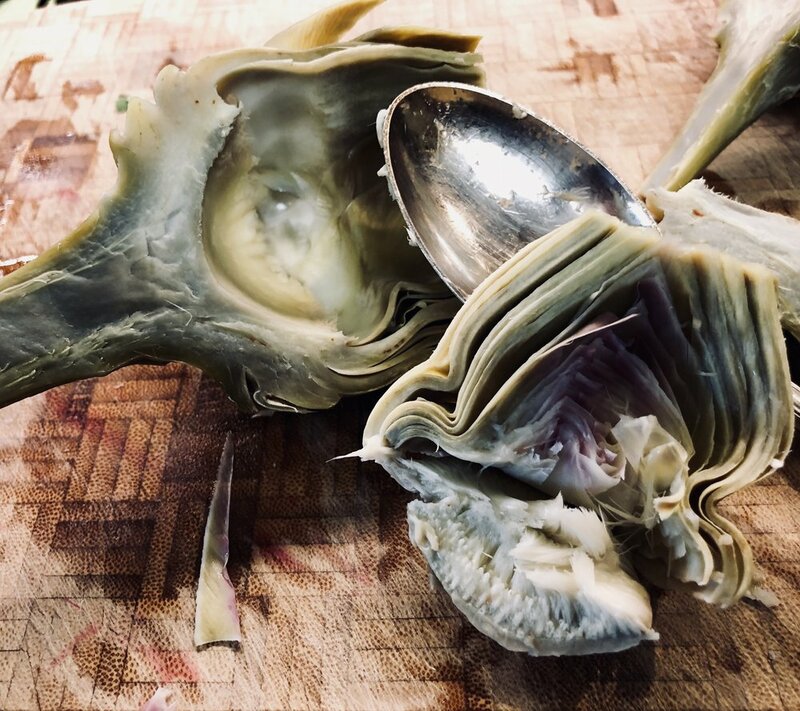 With a spoon scoop out the inside “choke” and remove the inner and outer leaves so all that remains is the artichoke “bottom” and stem. Cut those halves into quarters. Set them all aside. In heavy bottom soup pot, add a few glugs of olive oil and begin to heat…not too hot though. Add the diced leeks or onions, along with the garlic, and being to cook slowly. Once soft and bright (if using leeks) add the diced prosciutto and cook another five minutes. Next, add the quartered artichokes, frozen or fresh fava beans, followed up with the green peas. Pour in the chicken stock and a good pinch on Cook’s Line Seasoning or your salt and pepper to taste. Cover and simmer slowly for thirty minutes or until everything is tender. Once everything is tender add in your chopped spinach or chard, along with the stem of oregano and chopped mint. If you think you would like more stock then go ahead and add it. Give it a good stir then cover and simmer for 20 minutes. Adjust any seasoning to taste. When ready, ladle out a nice hearty serving or two into a bowl. Garnish with ribbons of Parmigiano-Reggiano cheese on top and maybe a drizzle of good olive oil. Serve with grilled ciabatta bread and/or freshly cooked pasta. Enjoy!